Who doesn’t crave for Thai food? Unlike the ever-so-popular Chinese fried rice and chillie paste that has even influenced ordinary shops in and out of Colombo, Thai food has that extra something which makes it more authentic. 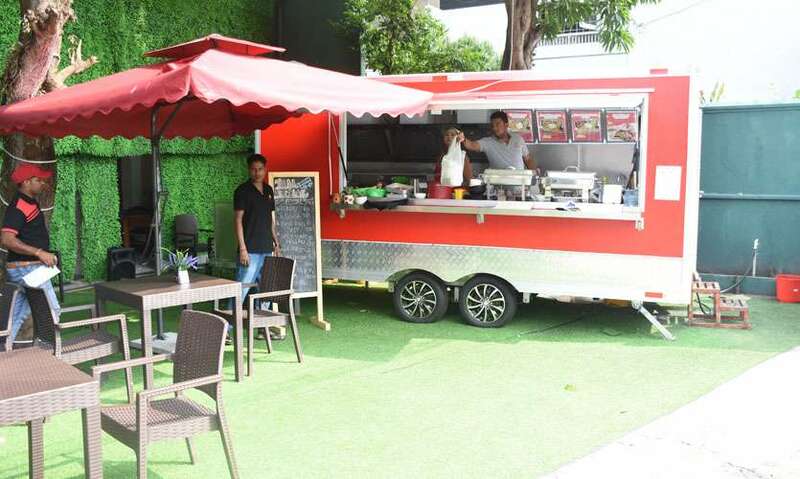 Bringing in a unique Thai flavour to Colombo’s culinary scene is the Thai Heritage Food Truck (THFT) located in the heart of Havelock Town. THFT is the brainchild of Uditha Sunnadeniya, his sister Savindri and wife Himashi. As a regular visitor to Thailand, Uditha has been a fan of Thai street food for a while. As the owner of Cey-Nor seafood restaurant, Uditha has been in the business for a while. The Thai Heritage Food Truck offers a range of delicacies prepared by Suri Wan Yang Thong, its in-house chef. Quite interestingly, all sauces too are made in house to add that extra touch of authenticity. Mrs. Suri has been employed at Lemongrass, Barracuda and several other restaurants before she decided to bring in her culinary expertise to the Thai Heritage Food Truck. She says she likes to cook and as we observed during our visit, she is seen cooking for the most part of the day to entice the customers with her culinary magic. What’s quite unique about this Thai food outlet is that the food is served in generous potions at an affordable rate (an opportunity that all foodies look forward to but seldom found). As an outdoor eating space, THFT will not be that quiet lunching or dining place you would be looking for. Since it is situated by the side of the road, it would be quite noisy during most parts of the day. But it has a green background with a green carpet which makes it look quite an eco-friendly space. We suggest that they grow plants on the walls and have a smooth turf to make it look more natural. However, it doesn’t get filled during the lunch hours and that is the advantage for those who choose THFT as a lunching spot. Within months after its opening, THFT has been popular for takeaways rather than dining in. 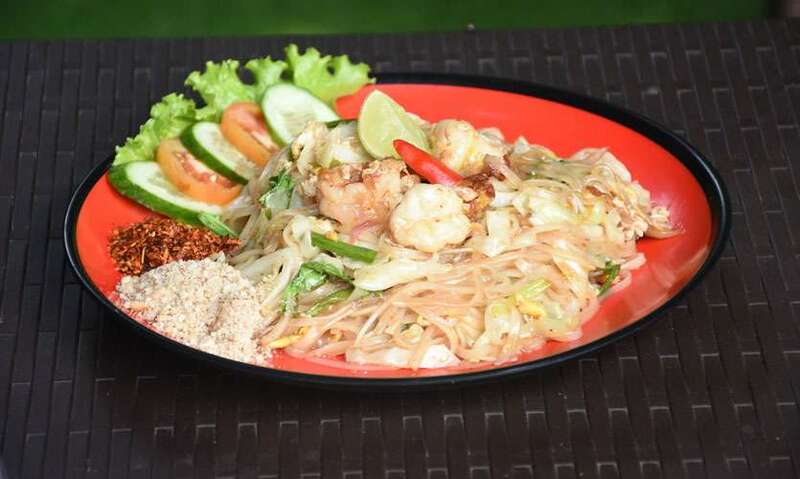 Apart from the usual Pad Thai noodles, THFT has a range of delicacies to offer to its customers. Their menu is quite simple and gives you a few options to choose from. For drinks we had their Lime Ginger Juice (Rs. 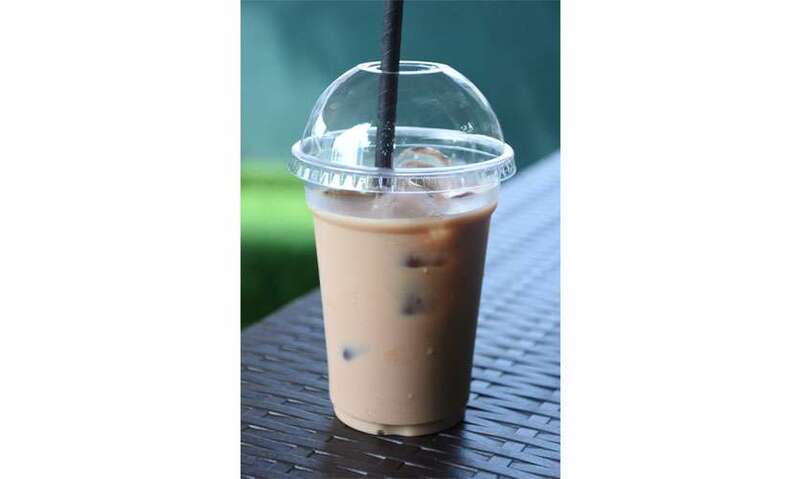 300) and Thai Iced Tea (Rs. 400). Both beverages didn’t have a significant taste but they could be ranked as absolute thirst quenchers on a warm, sunny day. 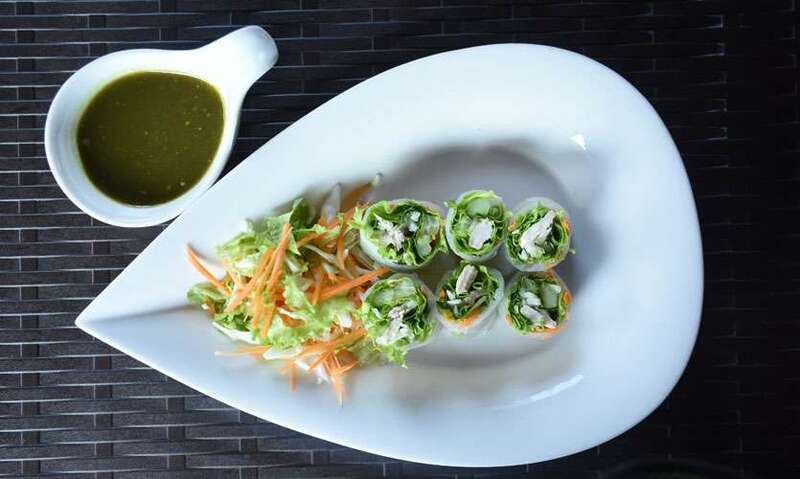 The Vietnam Healthy Spring Rolls also known as Rice Paper Rolls with minci sauce (Rs. 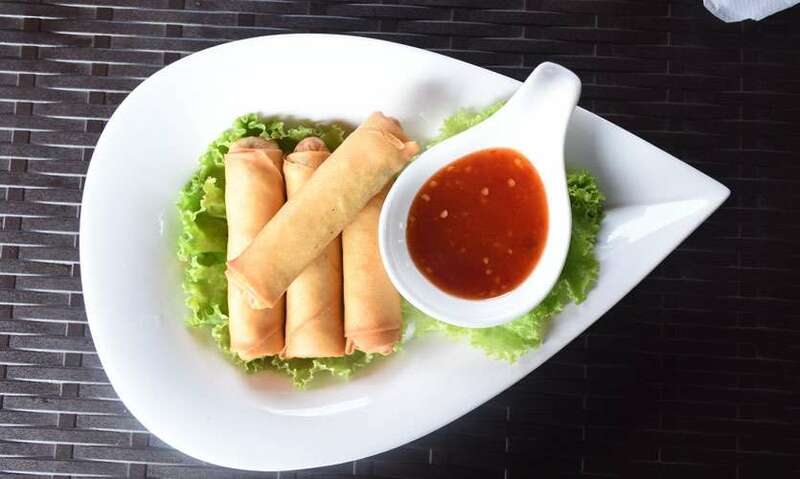 500) and Spring Rolls (Rs. 400) were served as appetizers. Rice paper rolls are accompanied with a cabbage and carrot salad and the minci sauce is a little spicy. We then had the Tom Yum Seafood Soup (Rs. 750) which was once again spicy but had the extra seafood flavour with its addition of prawns. 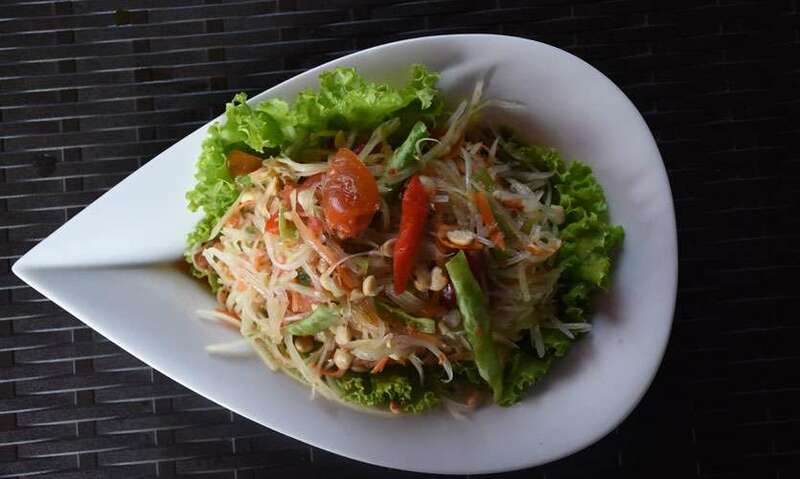 The Papaya Salad (Rs. 400) is another popular appetizer at THFT which includes a generous serving of papaya along with beans and carrot. By the time we were done with the appetizers we actually had less space for mains. But one cannot say no to its Chicken Fried Rice (Rs. 650) along with its Signature Red Curry Chicken (Rs. 750). The chicken fried rice was quite filling and had big cubes of chicken and that coupled with their Signature chicken curry was an actual deal for someone with a good appetite. We also had their Pad Thai Noodles (Rs. 800) which is a favourite among Thai food lovers. It was a seafood option and was accompanied by a chillie paste. Although we didn’t have desserts THFT offers a signature Thai coconut sago pudding which we will definitely try on our next visit. (Yes, we will visit them again!). Although THFT is at its infant stage, we recommend it to any Thai food lover. It may not be the perfect place to dine in on a rainy day but since they have takeaway options do try them the next time you crave for some affordable Thai food.